The analog R&S®SMC100A sets new standards for attractively-priced signal generators. It has the smallest size and the best price / performance ratio in its class. The R&S®SMC100A offers outstanding signal quality at an attractive price. It covers the frequency range from 9 kHz to 1.1 GHz or 3.2 GHz. Output power is typically above +17 dBm. All important functions (AM / FM / φM / pulse modulation) are already integrated into the instrument. 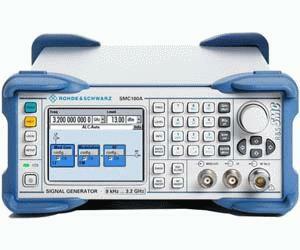 This makes the R&S®SMC100A signal generator a flexible and versatile instrument. Total cost of ownership is an important factor when purchasing a measuring instrument. The R&S®SMC100A offers a low initial cost, and also boasts low service costs since users can replace defective modules on their own and verify the level repeatability and accuracy by using the R&S®NRP-Z91/-Z92 power sensors. These outstanding features make the R&S®SMC100A ideally suited for use in service and maintenance labs. Due to its small dimensions and lightweight design, the R&S®SMC100A is also the perfect choice for field applications or training and education environments.